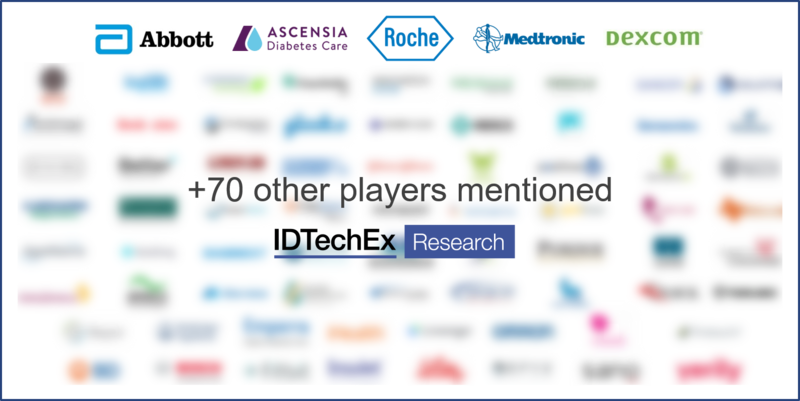 BOSTON, Aug. 30, 2018 /PRNewswire/ -- IDTechEx Research has recently released a new market report "Technology for Diabetes Management, 2019-2029: Technology, Players and Forecasts," including details of glucose test strips, continuous glucose monitoring (CGM), insulin pumps, insulin pens, digital health / digital therapeutics, side effect management and diagnosis. The report covers the entire landscape for diabetes management devices, including mature, emerging and future options. The report has been researched via primary interviews with companies, physicians and diabetic individuals to characterize and predict the technology landscape for diabetes devices over the coming decade. In total, activities of 75 companies are covered throughout the report, ranging from the largest players to technology developers and startups developing the next generation of device options. Historically, diabetics have monitored their blood glucose concentration by using disposable biosensors; following a finger prick, a drop of blood is placed onto a glucose test strip, which is inserted into a reader to provide the result. Whilst billions of test strips are produced each year, this sector has seen profitability shrink due to changing medical subsidies and increased competition. Alternative options have been developed to enable continuous glucose monitoring. These involve devices that are typically worn on the skin, using a sensor on a small needle to test glucose in interstitial fluid. There are now approved devices from several key players, with this industry growing each year. However, challenges still remain with glucose monitoring devices, with the ultimate aim of providing the best experience for diabetics. CGM devices in the past have been reliant on test strips for calibration, as well as still being invasive or implantable, leading to discomfort. This has led to many players investigating glucose monitoring options which are less invasive, whilst maintaining the required accuracy and reliability. In addition, the possibility of pairing CGM devices with insulin pumps for increasingly automated "closed-loop" systems is becoming increasingly closer. These goals have been in place for decades, and the report follows all the latest news, trends and outlook in each of these technology frontiers around diabetes management devices. However, managing diabetes is about more than just monitoring glucose levels. The report also covers other aspects of diabetes technology landscape, including insulin delivery, the role of digital health in diabetes, technology for managing side effects, technology for diagnosis and reimbursement, funding and investment examples. The report then includes detailed market forecast following two different methodologies. The first involves the collection of revenue data from companies throughout the space, with historic data back to 2010 by company and by sector. This is then projected given a series of assumptions based on IDTechEx's primary research efforts. The second forecast scenario involves looking at data for the diabetic population, including number of diabetics, split by type, percentage diagnosis, and then adoption rates by device type for each group. The two forecasts are then discussed and compared, providing with the reader with ample content from which to base business decisions and understand the dynamics in the space. - Sensors for diabetes management: This chapter includes coverage of glucose sensing, from test strips and glucometers, to continuous glucose monitoring (CGM), and through to a discussion of emerging options in this space. In total, 37 different companies are mentioned in this section, ranging from the largest players in tests strips and CGM (e.g. Abbott, Roche, Medtronic, Dexcom, etc.) through to many emerging players or innovators attempting new approaches to glucose monitoring. - Insulin delivery: This chapter covers techniques from traditional vial-and-syringe and insulin pens, to insulin pumps and towards closed loop insulin delivery alongside CGM. Key trends discussed in this section include the integration of different connectivity and technology integrated alongside both insulin pump and insulin pens, the links from these devices into wider digital health ecosystems and the adoption of newer devices (particularly insulin pumps) by territory and demographic. - Digital health: Chronic diseases are a prominent early target for those in the digital health ecosystem, and digital health options for diabetes have been prominent. This chapter discusses activities from both the small and larger players, including major acquisitions and collaborations, in areas including diabetes management systems, device companion software and digital therapeutics. - Side effect management: The majority of the costs associated with diabetes are around managing side effects. This section focuses on new technology options emerging around areas such as diabetic neuropathy, foot ulcers and ketoacidosis. This includes various wearable, flexible and textile-based technology options. - Diabetes diagnosis: discussing the use of emerging technologies to aid the early detection of diabetes, thereby preventing long hospital stays and other complications. - Reimbursement options, funding and investment examples: These final elements to the report fill in details which are important for the broader space. Reimbursement, whether through insurers, national healthcare initiatives or otherwise, is still critical for the majority of diabetes devices. Funding and investment are also present, as with any large, transforming industry. Over 75 companies are mentioned in the report, including many primary interviews, a patent analysis of the key patent-holders, and revenue data where relevant. If you would like more information on this report please see www.IDTechEx.com/diabetes or email research@IDTechEx.com.